Windows 8 comes with a lot of pre-installed – most of which you may not even use in the lifespan of that computer. What is the use of having such apps in your computer, which you will never use. You get apps Reading List, Sound Recorder, Health & Fitness or Alarm and much more. Many of these apps won’t be useful for you. For example – XBOX apps are of no use to you if you’re a Playstation user. While this may be useful to many users of the operating system, especially those on tablet devices and touch-displays, others may not want some or even all of those apps installed on their PCs. There is a new and easy way to remove all such apps from your Windows 8 computer using Win 8 App Remover. Win 8 App Remover is a free program for the Windows 8, Windows 8.1 and Windows 8.1 Update 1 operating system that you can use for that purpose. It is a desktop program and is not compatible with Windows RT systems. If you want to remove apps from the current PC, click on list apps to activate the app listing so that you can select apps that you want removed from the operating system. You can either use the select all button to check them all at once, or check individual apps instead if you only want to remove some of them. Once the selection has been made, click on the remove apps button to uninstall them from the system. Please note that there is no option to get them back using the application. It is recommended to create a backup or a system restore point first before you continue. 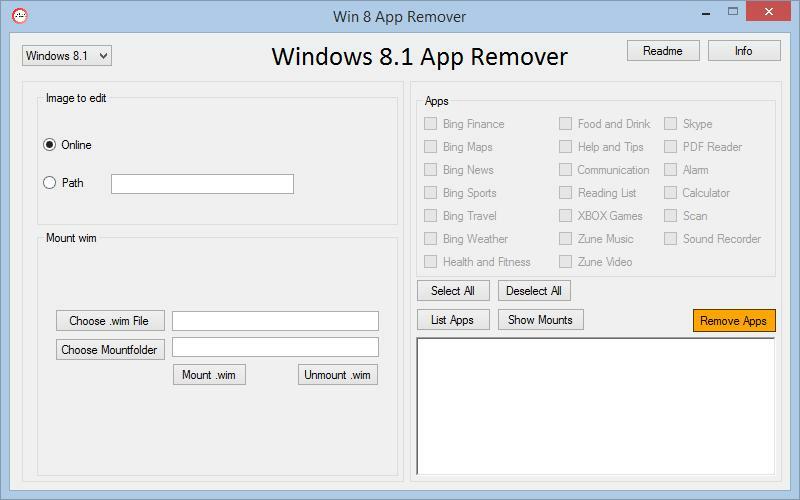 Windows 8 App Remover is a handy tool for Windows 8.x users who want to uninstall some of the default apps the operating system ships with. While it is also possible to hide them from the Start Screen instead, you can free up storage space if you remove apps that you have no intention of using. Besides running the operation on the current PC, you can also mount .wim files (Windows Imaging Format) and remove apps from them.